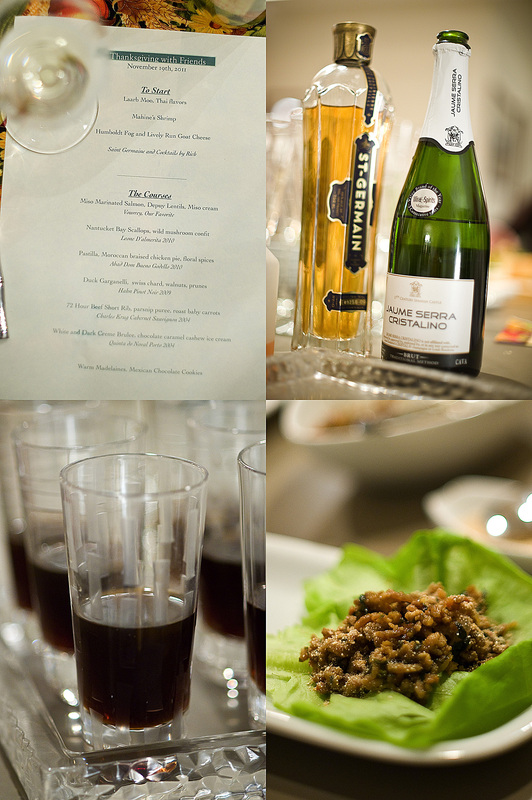 Thanksgiving with friends….10 courses of perfection! We are so very lucky! Our wonderful friends Mark and Tammy hosted a pre-Thanksgiving gathering, and Heather and I were fortunate enough to be included. 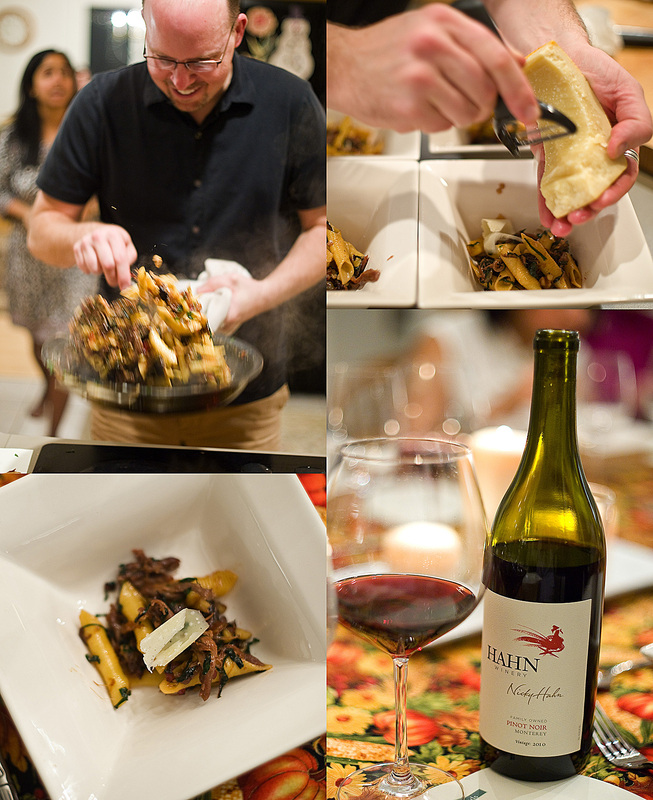 From start to finish, this amazing meal was both visually stunning and incredibly delicious. My only faux pas was that I was too busy enjoying Mahine’s shrimp (one of the fabulous appetizers) to remember to photograph it before it was devoured! If you count the cheese course served with the cocktails, it was a 10 course meal!! I will give details about the cocktails in an upcoming post, but for now, enjoy looking through the pictures below. If you have questions on the food prep, let me know and I will direct them to Chef Mark. I hope you enjoyed your Thanksgiving (and time with family and friends) as much as we did. And… I have to say that I am very thankful for all of my friends, followers, and readers. I appreciate all of your positive comments, and enjoy sharing our culinary adventures with you! Cheers, salud, kanpai, prost, noroc, mabuhay, a la sature, pura vida, salute, À votre santé or however you say it (one for each course)….to your health! The menu, pre-dinner cocktails, and laarb moo. 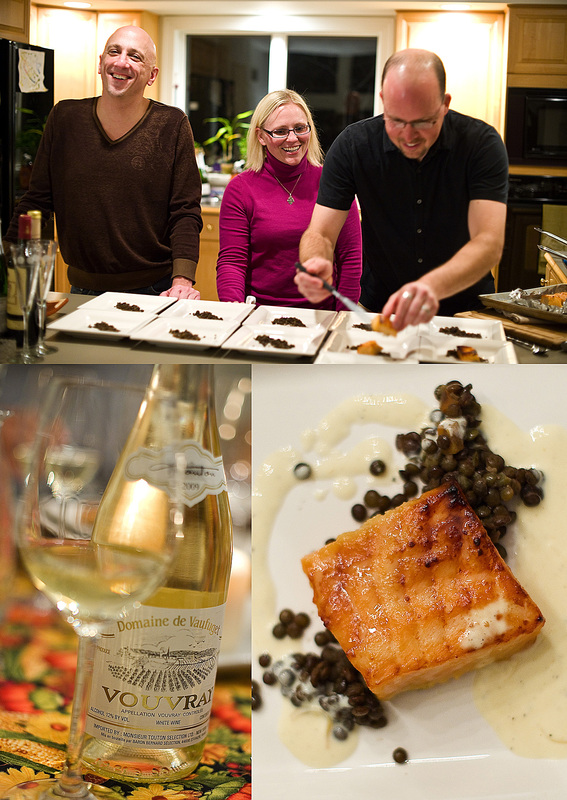 Kevin and Tammy watching Mark cookin' the food, Vouvray white wine from the Loire valley, and miso marinated salmon with du Puy lentils and miso cream. 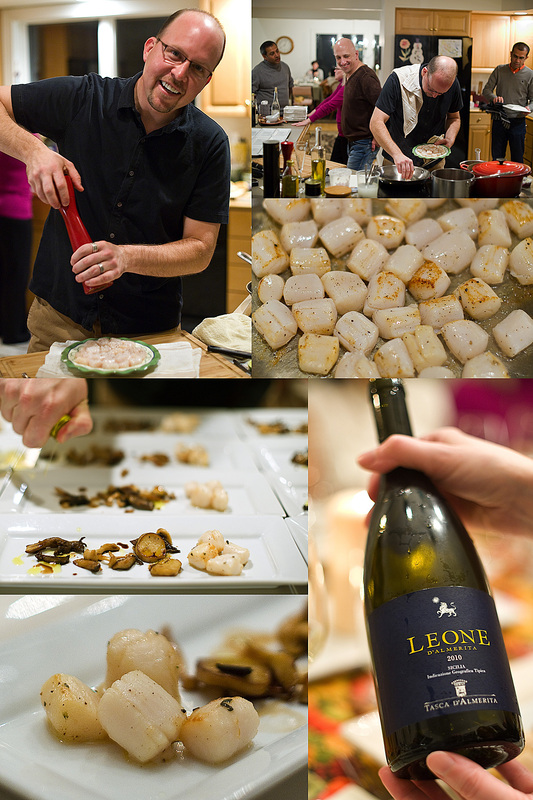 Start-to-finish Nantucket Bay scallops with wild mushroom confit and Leone D'Almerita Sicilian white. 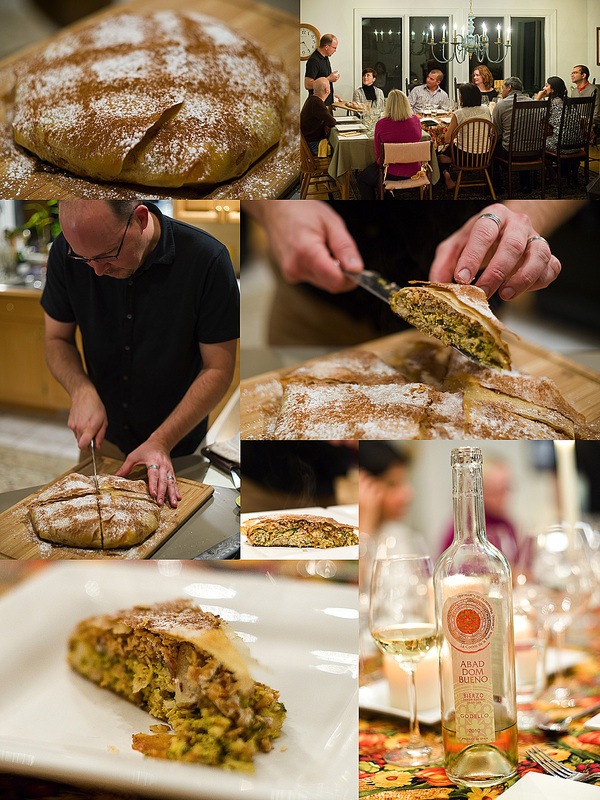 Pastilla (Moroccan braised chicken pie as discovered by Mark and Tammy on their trip to Morocco) and Abad Dom Bueno Godello Spanish white. Duck garganelli with swiss chard, walnuts and prunes complete with a flip from Mark! Hahn Pinot Noir from Monterey. 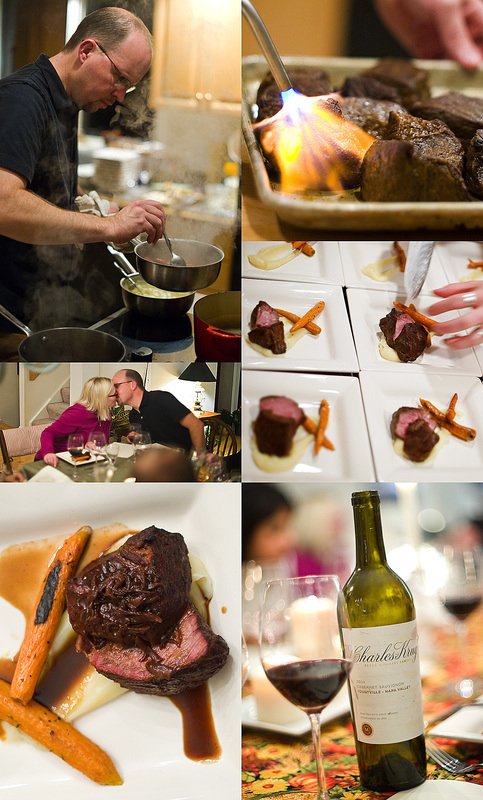 72 hour beef short ribs with parsnip purée and roast baby carrots. 2004 Charles Krug Cabernet Sauvignon from Napa. Mark torching the white and dark creme brulee, which was then paired with chocolate caramel cashew ice cream and Quinta do Noval Porto. 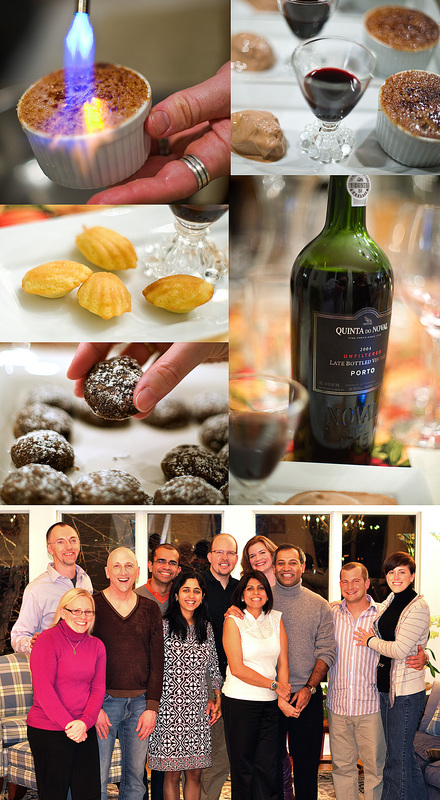 For second dessert, we were treated to warm madelaines and Mexican chocolate cookies. You can tell by our smiles that the meal was phenomenal! 11 reasons to like this post…. 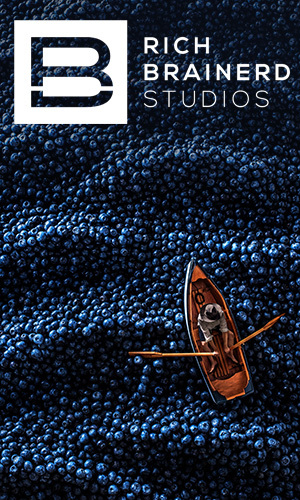 I couldn’t resist the post title given today’s date….11/11/11. And it’s 11:11! Despite all that ….this truly was an awesome treat! 1. A bottle of blue agave nectar! 2. Gooey drips of agave nectar! 3. Agave nectar is roughly 1.3 times sweeter than suger, but has a lower glycemic index, and it absorbs more slowly into your system. 4. Light and creamy ricotta cheese! 5. Gently grilled crusty baguette! 6. Wine in a blue bottle, to go with the blue agave! 7. Ricotta cheese spread with an antique spreader on the grilled baguette! 8. Don’t forget the pepper! 9. More specifically…Finger Lakes wine! 10. Swedish Hill 2009 Vidal Blanc. The wine has a little sweetness to pair with the agave nectar, and it was nice and crisp with pear and peach notes. This was a great appetizer on a recent warm fall weekend, but would be great anytime of the year. I hope you get to try some later today, to make your 11/11/11 better. Cheers! 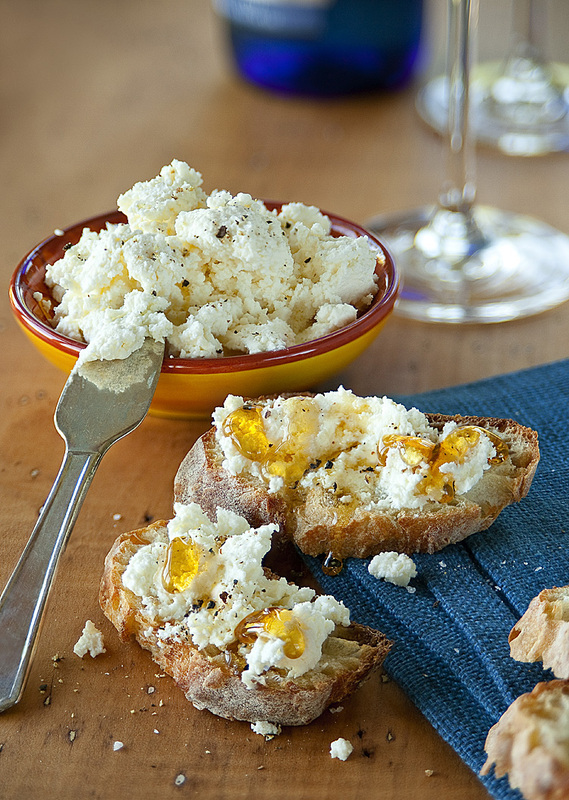 Grilled baguette topped with ricotta and blue agave nectar. Oh my! 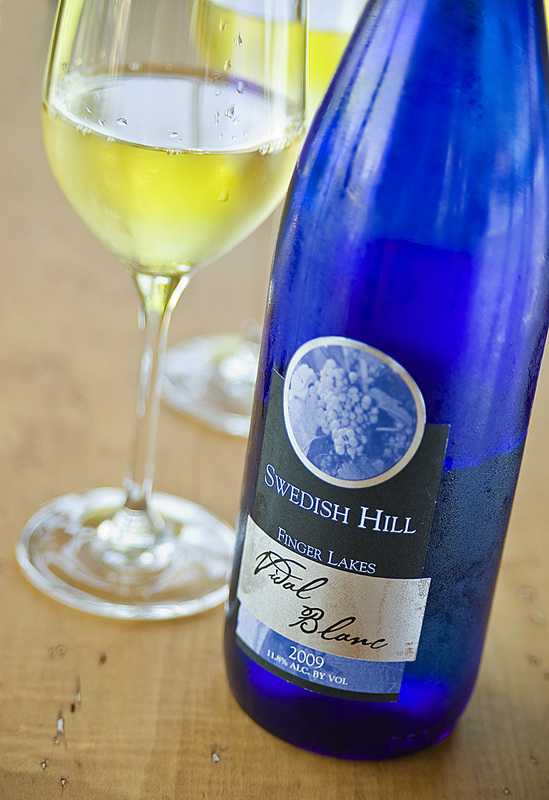 Swedish Hill 2009 Vidal Blanc. Yum! 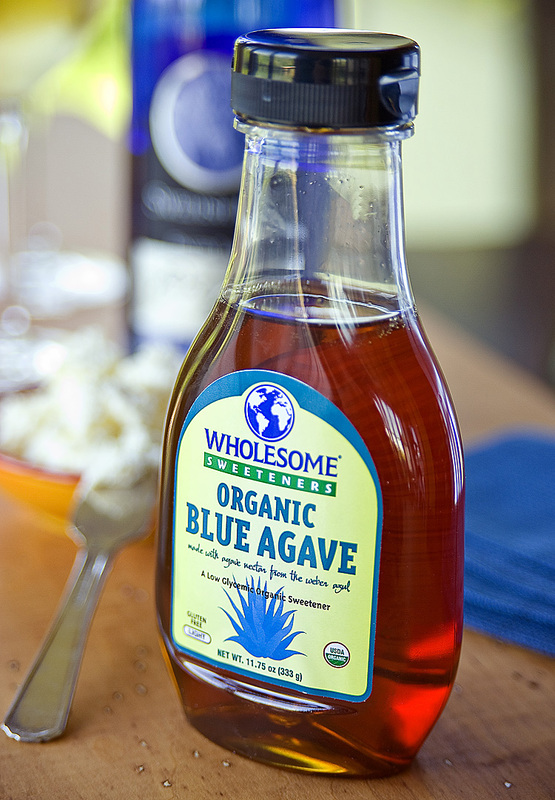 Blue agave nectar. A very sweet treat! Eat up, me hearties, yo-ho! I think we should call this the pirate taco. 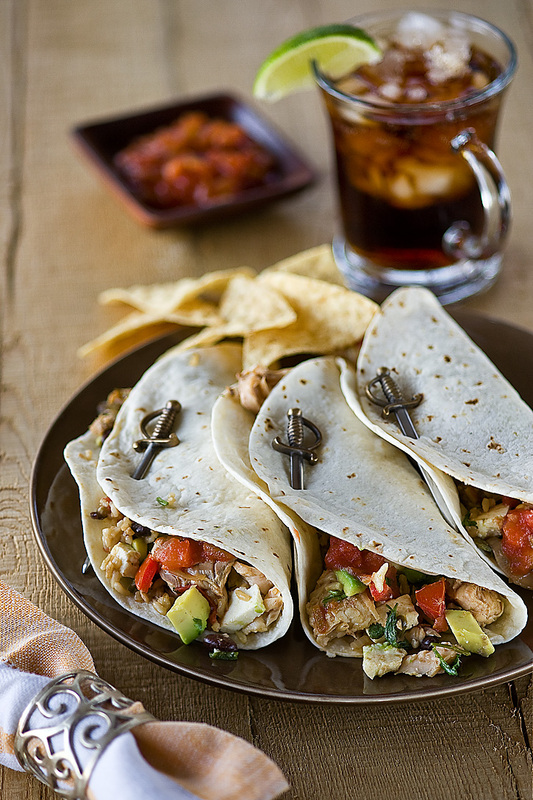 “Fish taco” just doesn’t have enough character, especially since I cooked it with spiced rum! My brother in law dropped off a freshly caught rainbow trout for us on Friday night. (Thank you, Jamie!) We consulted Chef Mark on a cooking method and settled on baking it wrapped in parchment paper, while stuffed with thyme, lemon, garlic, onions and bay leaves. It was a great meal, but time (and hunger) did not allow for photos. Since the fish was huge, we had plenty left over for the next day. Thus the creation of the pirate taco! I started by sautéing some onion slices and diced jalapenos in a touch of olive oil. Once browned, I threw in black beans, rice, diced tomatoes, the leftover fish, some chopped cilantro and cotija cheese. I then poured in a few ounces of spiced rum to steam it since I really only wanted to heat everything up quickly. Once warmed, I added some diced avocados, lime juice, seasoned with salt, and tossed before serving in lightly grilled flour tortillas topped off with salsa and sour cream. Enjoy with rum for a true pirate experience! The pirate taco. Fire up the stove, Matey!